BAD IDEAS? traces the fascinating history of our attempts at self-improvement but also questions their value. The dubious consequences of the development of weaponry, for example, is self-evident from the primitive but lethal sling to the devastating nuclear bomb. But what of apparently more innocuous inventions such as farming, writing or medicine? All were initiated for the greater good but have nonetheless produced unforeseen fallout that continues to this day. What are their undesirable side-effects, how did they emerge over the years and where will they take us in the future? Written against a huge historical canvas, we join Robert Winston on a thrilling and inspiring journey from our earliest days to the present. We learn about the history of modern science, engineering, IT and much more, following the unexpected twists and turns of their progress. We meet the individuals who played a key role in their development, and share quirky anecdotes about their lives and brainwaves. 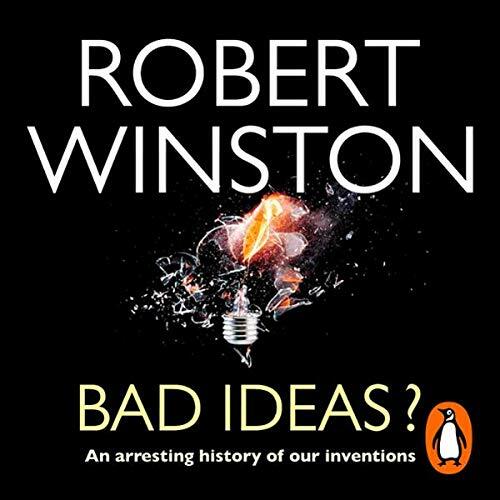 Inspiring, unusual, and at times controversial, BAD IDEAS? enables us by appreciating the past to look forward to the technological opportunities and ethical challenges of the future. In so doing it celebrates man’s extraordinary capacity for achievement whilst warning us that his good intentions can sometimes end up as thoroughly bad ideas. I loved this book, it covered a variety of subjects from engineering to medicine and beyond. This book gives a great factual account of our history, tells you the facts and the fiction behind them and also has amazing unknown facts and tales to tell. It was one of those 'Oooh...I didn't know that...' books. Unfortunately, it didn't help me fall asleep as I was eager to listen on!!! I found this book interesting of course, anything Dr Winston does is interesting. But I found myself a little bit bored and more than anything else I found myself getting more and more annoyed with his voice. He slurrs some of his words and at times it can be really off-putting. Not the ground-breaking, thought provoking or challenging read I had hoped for but it was OK.